On 11 December, Tony Abbott addressed a lavish fundraising dinner, hosted by “Recognise”—an organisation campaigning for recognition of Aboriginal and Torres Strait Islander people in the Australian constitution. Recognise was established with a $10 million government grant and receives generous corporate donations. The attendance list for the dinner included a who’s who of corporate and government elites. In his speech, Abbott insisted he was “ready to sweat blood” for the cause of constitutional recognition, adding “this is at least as important as any of the other causes that this government has been prepared to take on”. Abbott has been crystal clear that his notion of “recognition” will have nothing to do with granting Aboriginal people any actual rights, or providing redress for past and continuing injustices. Aboriginal people were still being massacred when the Australian constitution was adopted in 1901. It is a thoroughly racist text, the founding document of a nation state premised on the genocide of Indigenous people and the exclusion of non-whites. “Indigenous recognition… will take the form of a pact—a heartfelt pact—between Indigenous people and conservative Australia. Indigenous people have to accept that any proposal put forward is worth doing because it does sufficiently acknowledge them as First Australians. And conservative Australia has to accept that any proposal put forward really is completing our constitution rather than changing it”. In other words, Abbott wants Aboriginal people to accept some flowery poetry in a preamble of the constitution, which will recognise that their ancestors did in fact exist when the British military dictatorship arrived in 1788, but will not recognise the attempted annihilation of those ancestors by the state or their right to a single square inch of the continent. Meanwhile, the Liberal government has been continuing with their historic process of decimation. Their first budget, which cut more than $500 million from Aboriginal programs, began the deepest crisis in Aboriginal affairs since the Intervention in the Northern Territory began in 2007. Every month has seen the announcement of some new attack, either by the Commonwealth or racist state governments emboldened by the conservative climate. The most shocking is the complete withdrawal of Commonwealth funding for basic services from impoverished remote Aboriginal communities, leading the WA and SA governments to announce plans to close communities down and remove thousands of people from their traditional lands. Funding Recognise and stringing out a fruitless debate about constitutional change has been a very deliberate strategy to distract from this crisis and paper over the deep racism destroying Aboriginal lives across Australia. The “Recognise” campaign often draws historical parallels between its own efforts and the successful 1967 referendum, which allowed the Commonwealth to make legislation for Aboriginal people. This granted a citizenship status to Aboriginal people they had long been denied. This success came after many years of campaigning by Aboriginal activists, trade unions, churches and other supporters of Aboriginal rights. It came in a very specific context—Aboriginal people across the country were living under discriminatory “protection” regimes run by state governments, controlling their income, movement, relationships and infamously overseeing the mass removal of Aboriginal children. The referendum campaign saw itself as challenging this second class status. But the success of 1967 had no immediate impact in this regard and grassroots momentum for change continued to grow. Indeed, disappointment at the failure of the then Liberal Commonwealth government to use its new powers to seriously address the gross injustices was one of the main factors driving the radicalisation of Aboriginal politics in the late 1960s and early 70s, which culminated in “Black moratorium” marches in capital cities and the establishment of the Aboriginal Tent Embassy in Canberra. In contrast, today’s referendum campaign has been driven almost entirely from the top down. The push has its roots in the final months of the Howard government when, following the announcement of the NT Intervention, Howard tried to soften his image by declaring his desire to see a new preamble to the constitution which would acknowledge prior occupation of Australia by Indigenous people. Kevin Rudd’s government oversaw the implementation of the NT Intervention, the expansion of income management across the country and the eventual extension of Intervention laws for a further ten years. But it also built on Howard’s “recognition” momentum, announcing the appointment of an “expert panel” to consider the form constitutional change could take. Appointees included conservative Aboriginal figures who had supported the NT Intervention like Noel Pearson and Marcia Langton, along with more liberal leaders Pat Dodson and Megan Davis. This panel recommended more thoroughgoing changes than the government had expected. Along with the inclusion of a preamble recognising prior Aboriginal occupation of Australia, the panel also recommended substantive changes to the constitution itself. These included removing a constitutional clause that allows the exclusion of particular racial groups from voting in elections. The panel also wanted a clause guaranteeing that the Commonwealth powers granted in 1967 to make laws for Aboriginal people would only be used for their “benefit”. Most controversial has been the recommendation for an explicit constitutional clause prohibiting discrimination against any group in Australia on the basis of race or ethnicity. The expert panel held consultation meetings in Aboriginal communities across Australia, where they found widespread support for clauses that would protect against discrimination. This is entirely understandable. The Commonwealth has used its 1967 constitutional powers to introduce overtly discriminatory policies such as gutting Native Title and more recently the NT Intervention. The Racial Discrimination Act (RDA) was also suspended to bring in these policies, leading many to believe a constitutional clause would give them more protection. But the RDA was re-instated in full in the NT in 2012 and the Intervention continues. Under Australian law, these laws are officially held to be “special measures” for their own good, regardless of what Aboriginal people may think of them. There is no reason to believe they would interpret a constitutional clause any differently. Mainstream Australia thought the mass child removal of the Stolen Generations was similarly “for their own good”, and the same logic drives the current wave of removals by “child protection” agencies. As the radical movement of the 1960s and 70s discovered following the 1967 referendum, the only true guarantee against discrimination is anti-racist struggle—large scale social movements to shift social attitudes and defeat racist government policies. But despite these suggestions from the “expert panel” being explicitly crafted to win support from the Liberal party and posing no real threat to their agenda, an ideological opposition to the concept of Aboriginal rights has seen the Liberals reject the proposals. All they are willing to do is to change the preamble and perhaps remove the embarrassing clause about the exclusion of races from voting. It is testimony to the farce of the “recognition” process that, all these years later, we still don’t have a draft amendment that government would be willing to put to a referendum. But keeping the “recognition” discussion at this level of generality suits their agenda perfectly, because it is primary purpose is to whitewash over and distract from the obscene injustices facing communities. Young Aboriginal activists burned “Recognise” paraphernalia at a protest in Brisbane following Abbott’s speech, an expression of widely felt Aboriginal anger at the tokenistic nature of the entire campaign. Other Aboriginal people are more supportive of the need for constitutional change, but for the likes of Dodson and Davis from the expert panel, this support has so far been contingent on it bringing substantive rights, rather than simple “poetry” in the preamble. Such support may well evaporate as soon the government’s proposed wording is on the table and offers no such rights. As the recognition farce drags on, conditions in Aboriginal communities are deteriorating and people are reeling from the new wave of attacks. More than $500 million has been cut from the Indigenous Affairs budget. It is unclear where these cuts will come from and Aboriginal organisations across the country have been thrown into chaos, unable to plan beyond the next few months due to lack of certainly about future funding arrangements. On top of this, other programs have not been renewed, demonstrating a wilful desire to punish Aboriginal people and make their living conditions even worse. A taste of what the withdrawal of services and the “closure” of more than 150 Aboriginal communities might mean is the experience of Oombulgurri in the Kimberly, where residents were relocated to urban centres following the withdrawal of health, education, power and water services in 2012. In September 2014, bulldozers were sent in to raze millions of dollars worth of buildings and infrastructure to the ground. Many are living destitute in towns like Wyndham and Derby. The Liberal government are also committed to extending the core agenda of the Intervention—to control Aboriginal lives, organisations and lands to force assimilation into the Australian “mainstream”. Racist new funding provisions require all Aboriginal organisations to incorporate under the Office of Registered Indigenous Corporations, giving government officials enormous power to move at any time to sack boards, suspend staff and freeze assets. No such surveillance will be required of non-Indigenous organisations tendering for Aboriginal service contracts. Mining magnate Andrew Forrest chaired Abbott’s review into Indigenous employment, despite the failure of his 2008 promise to create 50,000 jobs in the private sector in two years. Six years later, it has not even achieved 20,000 short term placements. Unsurprisingly, the plan includes no recommendations for public money to create a single job in Aboriginal communities—just further plans to force migration and micro-manage Aboriginal life. Forrest recommended Centrelink recipients go on a “healthy welfare card”, which restricts what you can buy and prohibits cash withdrawals. In December, social services Minister Kevin Andrews signalled an intention to “trial” the card first in the NT. This would be even more draconian than the current 50 per cent income quarantine introduced with the Intervention. Meanwhile, both Commonwealth and State governments are ramping up attacks on hard won Land Rights. The Commonwealth is holding desperately poor NT townships to ransom, demanding 99-year township leases in exchange for services. Now regulations before parliament will allow for newly formed corporations, that can include non-Indigenous business people, to take over the function of negotiating leases over Aboriginal land from the long established Aboriginal Land Councils. Aboriginal people will have land sold out from under them without even a pretence of consultation. In WA, the Aboriginal Heritage Act has been completely gutted, allowing for the destruction of sacred sites by mining companies and other developers. While developers will be able to appeal heritage decisions under the new regime, affected traditional owners will not. In October, the SA government introduced draconian new powers to usurp control of the Anangu Pitjantjatjara Yankunytjatjara (APY) Lands from the elected Aboriginal council. In NSW, the Baird government moved in November to restrict all land rights claims over coastal areas, following a successful Aboriginal claim for some beach-front Crown Land on the Central Coast. 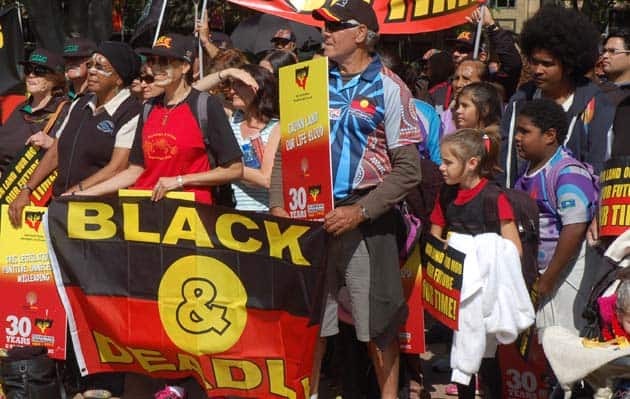 The NSW Aboriginal Land Council mobilised supporters in one of the first demonstrations it has seriously supported in many years. The government backed down immediately—though they are still threatening to re-introduce similar provisions this year. This successful protest action serves as an important lesson. Both Commonwealth and State governments are attacking Aboriginal interests with increasing ferocity. But unlike Howard’s concerted, poisonous NT Intervention campaign, these attacks are scatter-gun and politically fragile. In late November, Aboriginal leaders from across Australia met for a “Freedom Summit” in Alice Springs to discuss the current crisis. There were representatives from a broad spectrum—from business minded Land Council officials, to grassroots fighters from Aboriginal Tent Embassies. All were reeling from the scale of the current attacks and condemned the “Recognise” campaign as tokenistic nonsense. The Freedom Summit has called for protest action in Canberra, starting on January 26, invasion day. The plan is to begin a sit-in outside of Parliament House and build up for larger protests when parliament opens. Buses are already planned from Brisbane, Sydney, SA and WA, including from remote areas facing closures. On 13 February, the anniversary of Kevin Rudd’s “apology”, this sit-in will be joined by an important protest against the continuing forced removal of Aboriginal children. Currently, the Freedom Summit is focussed on replacing Abbott’s hand-picked Indigenous Advisory Council with another Aboriginal body, yet to be constituted, which would be genuinely representative of Aboriginal interests. What is desperately needed however is a serious of clear demands and a national strategy of mobilisation to beat back the vicious attacks being faced by communities across the country. So far there has not been a single significant protest, anywhere in Australia, against the devastating cuts to Aboriginal services. In the context of a deeply unpopular austerity agenda, such protests would find real resonance and stand every chance of success, witness Abbott’s recent backdown on cuts to Medicare. “Recognise” is masking a period of severe attack on Aboriginal communities which will result in more suicide, incarceration, child removal, unemployment, homelessness and preventable diseases. No tinkering with a thoroughly racist constitution can protect from these atrocities. Rebuilding a movement for Aboriginal rights that can confront them head on has never been more urgent. There is no point in adding text to the preamble of the Constitution. & Unless clauses are inserted into the Constitution itself, that address our inherent rights and gives us leverage to develop meaningful policies to us – then we, and generations to come, will continue to face the enormous disparities and inequities. Even looking at the expenditure reports. From the $30 billion that governments spend on us, only $5 billion is provided through Indigenous specific services. Instead of cutting $500 million from vital funding to communities perhaps governments could look for efficiencies within the $25 billion. I remain hopeful … & I always live in hope that one day we will have a voice that brings our people together … As many of the self appointed leaders who have the ear of governments are far too conservative to effect any change on the ground!! & governments do not listen to our voices from the grassroots!! Thankyou John Pilger for raising our issues again.. So well and so succinctly… U rock!!! The actual Preamble is an Act of Westminster and we oi oi ois cannot change it. It is just a few noice words intended as a preface to appear to fix the otherwise Terra Nullius Constitution Dea. That voice to bring people together is Sovereignty, which sits beyond and above any Constitution. Presently the occupant of some Palace near London reckons she is. Recognise was founded and formed before Abbott came into power. The campaign is as much driven by NGOs and civil society groups as it is by the Labor, Greens, Independent, and LNP politicians who cooked it up. The most radical critique, the critique spearheaded by women of color and voices for the most marginalised, the critique that identifies the grubby hand of corporate philanthropy as the enormous shadowy presence of the capitalist elite, is termed the Non Profit Industrial Complex (NPIC). Have a look at the extensive list of Recognise partners. Notice the presence of the ACTU and Oxfam on the NGO steering committee. It is by this presence that the NPIC corrodes the resolve for justice and commitment to the oneness of struggle. Sovereignty never ceded!